Click Here to Support the Show! Life moves fast and sometimes we need to step back and enjoy the moment or expand our point of view and look at the big picture. That is not the point of this episode. That was last week. Sometimes we need to move fast. We need to get in a speed workout to test our physical potential. We need to get four lunches packed, get in a full day of work, shuttle the kids to four places at the same time, and have a healthy dinner on the table. That is this episode. Running at a relaxing pace is great. It serves some major benefits and is most ideal for runners just starting out or coming off of a break. But let’s be honest, easy running day after day can get dull really fast. Also, you will not truly come near your physical greatness without some speed work. Speed work physically helps you with strength and range of motion, but not to the level that you should skip strength days or mobility exercises. It can also help your body convert fuel into energy faster and get rid of fatigue-causing gunk faster (and yes, that's a technical term). Mentally, speed work helps us deal with acute pain because it teaches a coping strategy of breaking the distance into smaller intervals. Additionally, when you know how fast you can run for a shorter distance, the slower pace needed for a longer race is less frightening. This can be a great benefit, but can be a crutch if you are trying to set a personal best 5k that also requires you to run your fastest mile ever. On the food side of the speed talk, let’s start with the busy life we live while also surrounded by convenient, but unhealthy options. To eat healthy and fast, you need simplicity, and little pre-planning, and a variety of healthy options on hand. Start by batch prepping. This is just a catchy term for make more than you plan on eating right then so you have leftover options. Angie likes to make beans, oats, and hard-boiled eggs on Sunday for the week. She also preps most of the fruits and veggies on the weekend so there are grab and go snacks in the fridge and not just granola bars in the pantry. Start with something and get the ball rolling. Step two is planning the dinners for the week. When you are already crunched on time, even figuring out what you want to eat seems exhausting. Plan this ahead of time and get some input from the whole family. This allows fewer shopping trips and less argument when the food hits the table. Also, be prepared for some repetition, because Taco Tuesday is loved by all! Third, have some very basic goals for your meals. Get in some dark greens, and really any veggies you can come up with because this can add great nutrients and simply bulk up your meal. Add a quality protein to make the meal filling. If you underserve yourself here, you may start searching for the afternoon snack later. Another move to avoid the poor choices we tend to make in the middle of the afternoon is to add fat to the meal. When our meal is richly satisfying, we do not need a cookie from the break room. Finish the meal off with a variety of carbs. Everyone needs these, especially if you are training higher mileage. We just all need them in different amounts. Lastly, remember to use your hand for portion control. Veggies should be a closed fist. Carbs should fit into a cupped hand. Protein matches the area and thickness of your palm. Fat corresponds with your thumb. Get at least one serving of each at every meal. There is a lot more to portions matching your body type, but this is a great place to start. In an ideal world we would all enjoy morning coffee and meditate about our path to greatness and how we can help others for a couple of hours before getting in a workout, nap, massage, and still prepping every meal from scratch. Here in reality, we need some quick wins. Speed work helps you physically reach toward greatness. Meal prepping sets up several chances for wins along the journey toward better eating. When every goal is very long term, the goals can seem unattainable. Set yourself up for wins along the way and the difficult path will seem much brighter. Hope you enjoy it!! Let us know if you have any questions that you would like answered on our show! We have SHIRTS! Check them out! Want to support the show? Join our patron supporters and be featured on our patron wall of fame! Need a new running and strengthening plan handed to you every month? Check out our all new RLR Tribe Membership, which takes out all of the guesswork, giving you a 30 min and 45 min option for your running days, with time-based and effort-based workouts so that you can become a stronger runner, no matter where you are right now on your running journey! It also includes runner-specific strengthening, drills, mobility work, and HIIT workouts to keep you running strong and injury-free. Come join us for the Key West Half Marathon on January 20, 2019! It is our first Real Life Runners destination race, and we would love to meet you in person! We currently have a discount code for our listeners, so if you are ready to register, use the code REALLIFE when checking out on Active.com for 15% off of your registration! Also, be sure to add yourselves to part of our team, Real Life Runners! Come and join us! Come find us on Facebook and Instagram and say hi! Click here to request to be added to our private Facebook tribe! Leave an honest review on iTunes. Your ratings and reviews really help and we read each one! Interested in Custom training plans and Personalized Coaching? Check that out here! Don't forget: The information in this website is not intended to treat or diagnose any medical condition or to provide medical advice. It is intended for general education in the areas of health and wellness. All information contained in this site is intended to be educational in nature. Nothing should be considered medical advice for your specific situation. *Note: Some links above are affiliate links and by purchasing through our link, we earn a small commission from your purchase. Your purchase price is the same whether you use the link or not. We would love your support so that we can keep producing great content for you on our podcast! Every dollar helps, and you can pledge as little as $1 a month to show your love and appreciation if you find value in what we do! Thank you so much! 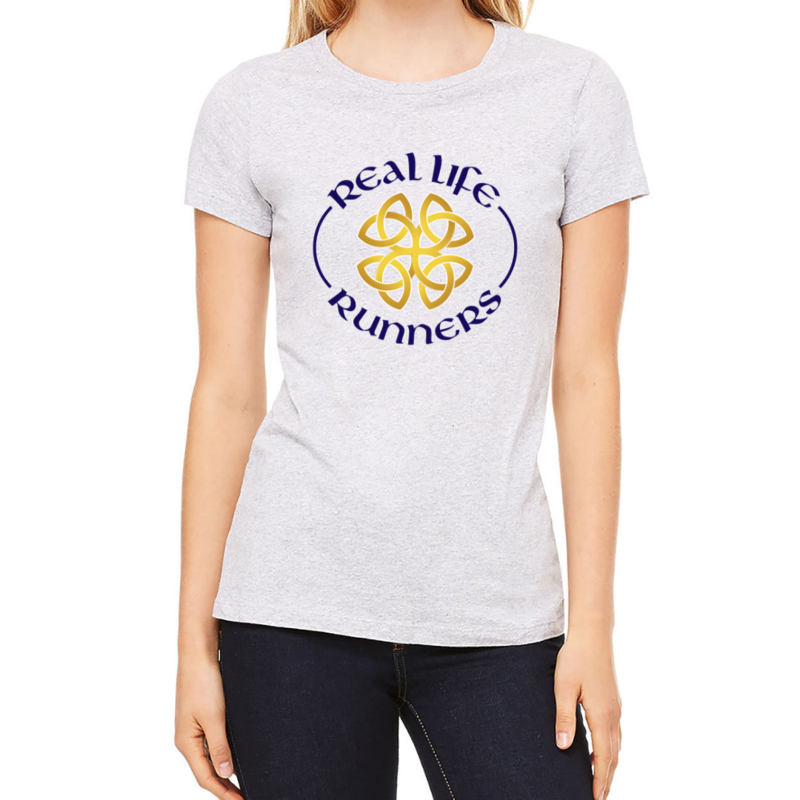 Show off your status as a part of the Real Life Runner's Tribe! Grab a super comfy t-shirt or racing tank today! Subscribe to our email list for exclusive offers and discounts and request access to our private Facebook group! 082: Are You Just Going Through the Motions? Enter your email address below to join our exclusive email list for members-only content and discounts and gain access into our private Facebook group today!